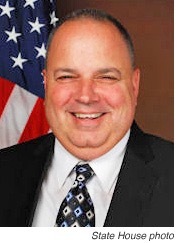 Rep. Dennis Canario’s (D-71) legislation (H 7793) that authorizes the Town of Portsmouth to issue $10,000,000 of general obligation bonds and/or notes in order to design, construct, equip and furnish a new police station passed the House of Representatives last night, according to a state house news release. The bill now heads to the Senate for consideration. The act would take effect upon approval by the voters of Portsmouth.